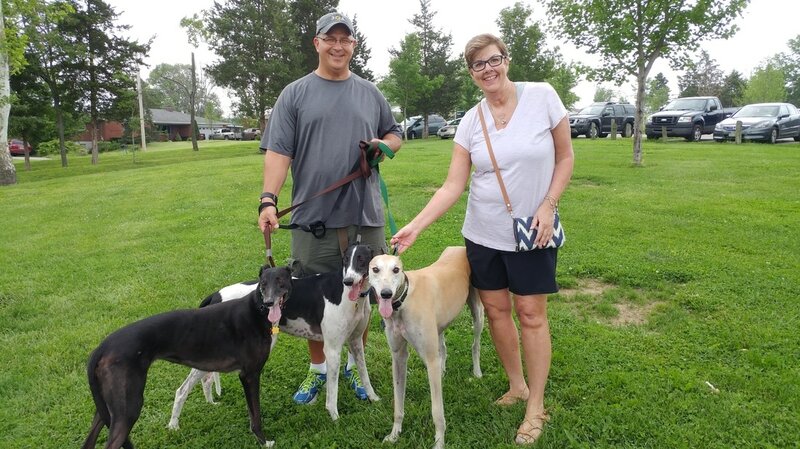 Debbie and Keith of Miamisburg adopted their first greyhound in 2014 and knew they would end up with several. At the GAGC picnic, white and black male Scrounger (call name Bear) worked his magic and they fell in love. They had recently lost their little girl Sadie to a tragic heart attack and Dale in particular was still mourning. Bear got along with both Skittles and Dale and ended up being the first of five dogs to get adopted at the picnic. Congratulations!